High Intensity Discharge (HID) reflectors have the best light broadcast and penetration. 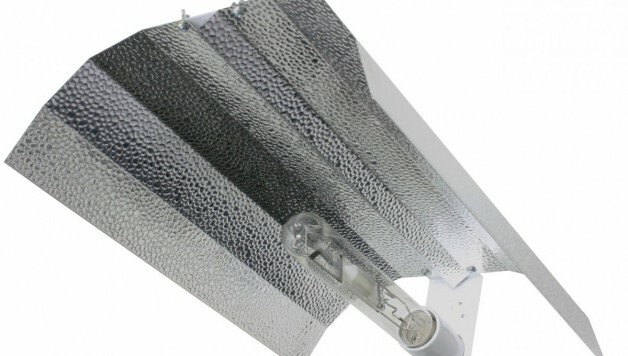 There are two reflectors needed for your indoor garden to receive the maximum advantage from your lighting. Reflectors on your lamp. Some reflectors are designed with hoods that have an opening to attach ducting to in order to keep the light from getting too hot as well as ‘cool tubes’. Reflection material for around your grow area. The best solution for this is some sort of reflective film such as reflective Mylar. Headache-Prevention Tip: It’s best to keep in mind that reflectors must be matched for compatibility with your ballasts. To receive the full impact out of your lighting unit, reflectors are needed as part of the complete lighting system. They come available in many different lengths and thicknesses for different applications. 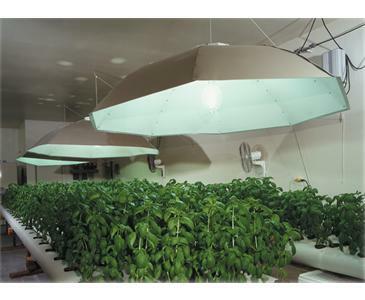 Reflective film can be used to line the walls, floor, and ceiling of grow room areas to maximize the reflection of the light back toward the plants. Reflective surfaces also help illuminate the lower portions of the garden, providing lower buds with light and heat energy. Using reflective materials reduces the energy requirements of your lighting and ballast unit so that they don’t have to work so hard. Simply put, you receive more energy per output. White poly is heavy duty, highly reflective plastic sheeting that can be used much the same as Mylar and can also be used to protect floors and other areas from spills and dirt. Overhead reflectors increase the lighting’s coverage area. Image via Miami Hydro. 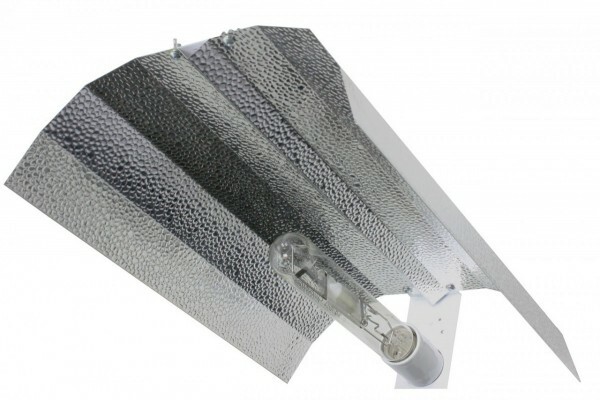 A reflector is needed to mount your grow lights in. They can be placed around the room, increasing the effectiveness of each HID bulb, while reducing the number of lights you actually need for your indoor garden. 1. Air cool-able: include glass shields with fittings to connect ductwork for cooling the lamps and cooling tubes. 2. Open air: include Wing and Umbrella styles. Air cooled reflectors allow you to maintain a precise temperature in your garden preventing the climate from getting too hot. Pair the reflectors with inline fans for cooling, ducting to direct the air, bulbs to grow your plants, and ballasts (required) to power your bulbs. Foylon: a spun polyester fabric reinforced with foil laminate. Foylon is resistant to most solutions, won’t tear or fade, and can be wiped clean. Slightly more expensive but its durability will more than make up for its cost. Mylar: reflective polyester film. Not quite as durable as the foylon, but is still fairly rugged. Elastomere paint: rubberized roofing paint with 90% reflection. Good for growboxes. Mildew resistant. Highly reflective. White/Black poly: useful if you are setting up a temporary grow room or don’t want to damage the walls. Poly is easily cleaned. Ensures your dark cycle remains dark. If this plastic is put too close to the light, it will obviously melt. What Not To Do: Do not use a mirror. Mirrors actually absorb light. You may decide to purchase a light meter to measure your light directly.